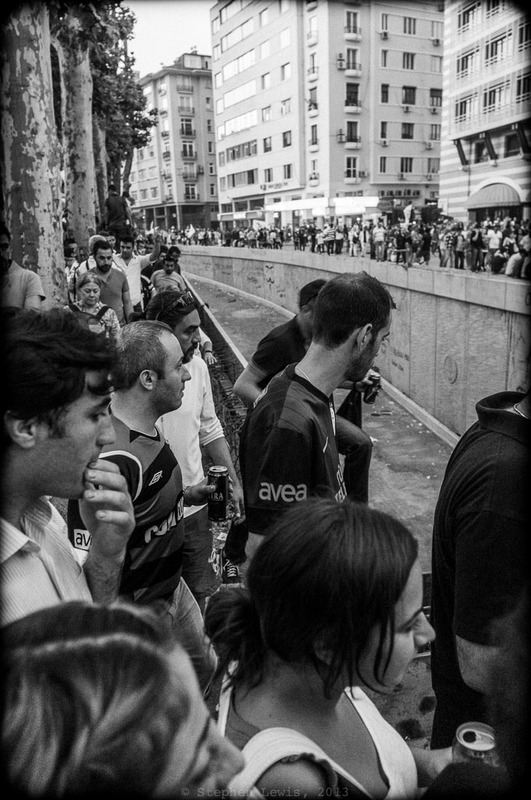 Marchers approaching Gezi Park from Osman Bey and Harbiye; Istanbul, early-June, 2013. In the center, the uncompleted open trench for an automobile underpass under and through Taksim Square, the main element in the road widening project that initially sparked the Gezi Park occupation. (Fuji X100). Click on image to enlarge. During the Gezi Park occupation, marchers from the direction of Harbiye and the residential neighborhoods beyond it appeared to be more diverse in age and in walks-of-life than those marching from the night-spot-filled side-streets and central promenade of Istiklal Caddesi. This past Sunday, such diversity was augmented by the large turnout for a lesbian and gay march to Taksim and Gezi Park. By itself, the Turkish government’s plan to shunt traffic under and past Taksim Square might indeed lessen vehicular congestion, thus freeing this iconic location from dominance by motor vehicle traffic. In conjunction with the plan to replace all of Taksim Square and Gezi Park with a massive complex of shopping mall, mosque, and fantasy reconstruction of a 19th-century military barracks, however, the underpass will instead deliver more automobile traffic into the urban core, a further step toward transforming a vital, unplanned, dense, “legacy” urban agglomeration into just another suburb. Had the early-twentieth-century American expatriate writer and aesthete Gertrude Stein still been alive, and had she visited Istanbul this month and last, she no doubt would have joined the protests at Taksim and Gezi Park and almost certainly would have attended the recent lesbian and gay march. American writer and humorist Dorothy Parker, a contemporary of Stein, once described the megalopolis Los Angeles as “… seventy-two suburbs in search of a city.” The present near-dysfunctional state of greater Los Angeles provides a cautionary tale for Istanbul as it continues its far-flung expansion and conversion into a near endless checkerboard of malls, office parks, and gated residential “communities” all interconnected by automobile traffic. Prime Minister Erdoğan, during his short-lasting temporary “truce” with Gezi Park protesters last month, promised to bring in a panel of tame, regime-friendly architects to advise on alternate solutions to the redevelopment of Gezi/Taksim. Placing architects in the roles of urban policy makers exacerbated urban dysfunction more often than it has cured such. Imposition of personal esthetic visions of three-dimensional constructs has been a part of the problem and will never be part of the solution. During the first days of the protests, an elegantly dressed elderly shopper in the up-scale quarter of Nişantaşı cheering demonstrators march towards Taksim, was overheard by a friend to have shouted: “We’re tired of our city being taken over by giant glass boxes.” A review in the weblog of the New York Review of Books of new exhibition in Los Angeles on the relationship between architecture and urban development (click here) makes this point crystal clear. For the better part of the first half of the twentieth century “master builder” Robert Moses amassed the political power to determine the physical infrastructure of the New York City and surroundings and, with it, the appearance and subsequent development of New York for decades, if not generations, thereafter. Erdoğan claims to be beholden to God, but Robert Moses was beholden to nobody. Even Albert Speer had Hitler to account to but Robert Moses was beyond the reach of voters, mayors, governors, and presidents. Nobody could stop him. His motorway projects cleared away densely populated neighborhoods (e.g. the central Bronx) displacing immense populations in the process. His beach and recreational shoreline projects (e.g. Jones Beach) enabled access by those well off enough to own automobiles but blocked access to the buses utilized by poor folks. Robert Moses’s power to shape what was the most powerful and dynamic city on earth according to his own vision seemed, at the time, eternal. Until, that is, a small group of powerless people, including urban theorist and writer Jane Jacobs, stopped him. Robert Moses’s Waterloo came when, in the early 1960s, more than a decade after he finished encircling Manhattan island with motorways, he attempted to build a highway across a broad swath of lower Manhattan, cutting 19th-century neighborhoods such as Greenwich Village and the quarters now know as Tribeca, Soho, and the East Village. He almost succeeded. His plans encountered a snag, however, when it became known that, to make way for the motorway, one of lower Broadway’s most characteristic cast-iron-facade buildings would have to be demolished for right-of-way. A series of demonstrations followed and, to make a long story short, Robert Moses’s demise ensued. Sound familiar, Istanbul? And What Would Robert Moses Say? If Robert Moses was still with us, he might have congratulated Erdoğan for getting tough and calling out the police last month as well as for pushing through a bridge project that will slash through Istanbul’s watershed and green belt. He might even have praised the Prime Minister for the audacity of his plan to cut a canal from the Black Sea through to the Sea of Marmara. But, Robert Moses would have also raised an eyebrow. Most of Robert Moses’s projects, no matter how disruptive and skewed towards the automobile, were well designed and well executed. Moses left a civic style worthy of and inspiring to New York and New Yorkers– from characteristic concrete and wood park benches, to Art Deco Egyptian revival bridge master’s huts on smaller spans, to the elegant giant works of his in-house bridge builder, Othmar Ammann. In addition, Moses’s earliest “parkway” (motorway) projects were indeed park-like, with landscaped shoulders and center dividers to add to what at time was seen as the “pleasure” of driving. We will never know for sure but the present plans for Gezi Park, Taksim, and the Atatürk Center probably would have left Robert Moses distinctly underwhelmed.